Christmas speeches are often expected as part of workplace celebrations or they may be included in a family get together on Christmas day. And, yes, it can be really hard work pulling a good one together. Unfortunately wishing won't write a speech. 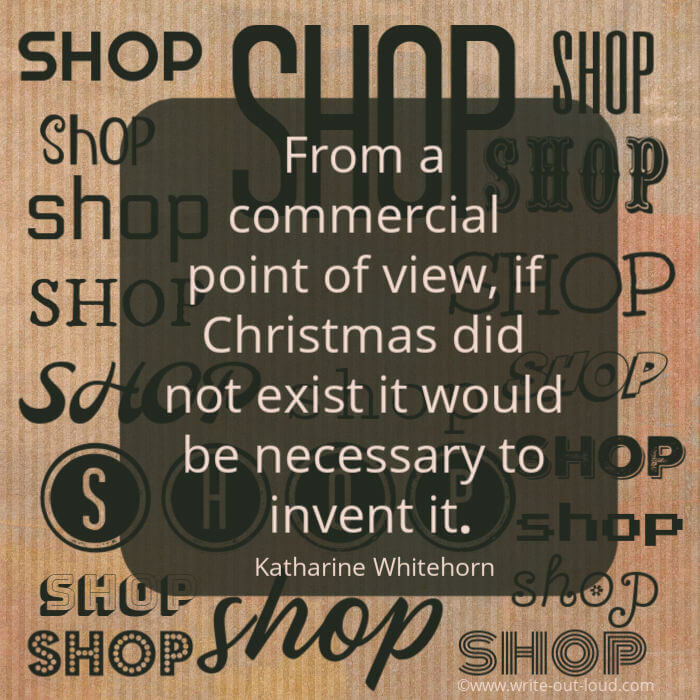 Neither do they do come gift wrapped so you won't find one under a Christmas tree with your name on it. However you can do this. You can find the right words, and make the speech you give a gift by keeping it short, simple and sincere. 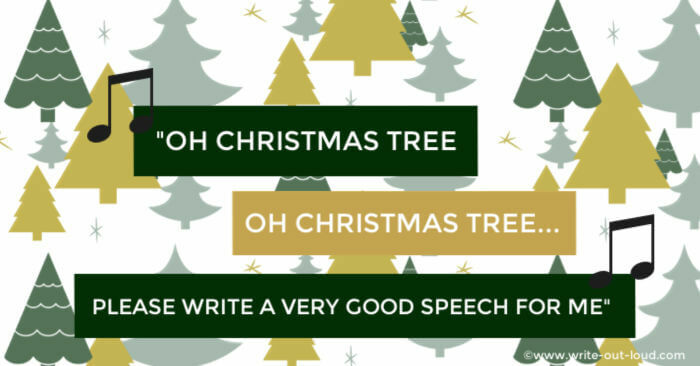 Use the Christmas Speeches template below to focus your thoughts, and then to create your speech outline. 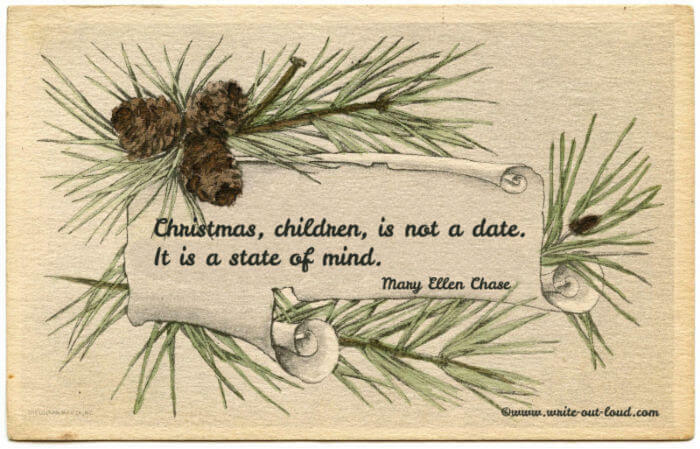 You'll also find a bunch of Christmas themed quotations when you scroll further down. They're there to slot in where ever you wish to support your chosen theme. Preparing your speech is a 7 step-by-step process and your effort will be appreciated. Check a completed Christmas speech outline prepared using this template to see how it works before you begin. It might help make the process easier to understand. Ready? Get yourself a sheet of paper, a pen and start. 1. Who is your speech for? Is it family, friends, work colleagues, club members ...? What do they want or expect to hear? What would delight them? Is it stories about the events of the year shared by everybody, the company triumphs or challenges...? Does the occasion suit light-hearted humor or is solemn more appropriate? Knowing exactly who the audience is will help you choose the tone and content of the speech. 2. What is the purpose of your speech? Perhaps you want to thank them? And perhaps what you want to achieve is a combination of all those suggestions. Being clear about why you making the speech will guide your choice of theme, tone and content. What's certain is you're not deliberately setting out to bore them by rambling on and on, then on some more. That's why you're here finding out how to put a Christmas speech together! 3. Where is the speech being delivered? The venue or setting can change how you deliver it. If it's an intimate family setting around the dinner table you won't need either a lectern on a raised stage or a microphone but in a hall in order to be seen and heard they might be absolutely necessary. 4. What theme is right for the audience? A theme is a thread to hang your speech on. It unites it. To keep your speech simple choose one. It's easier to begin with the body or middle of your speech because this is where you express your main points or ideas of your chosen theme. You will add the conclusion and beginning later. Choose 3 main points fitting your audience, purpose and theme. Start with the most important first. For each point you make give one or two examples to illustrate it. When you give your speech you'll link the points with transitions or bridges to get smoothly from one idea to the next. Transition or link to conclusion of your Christmas speech. The ending of you speech should leave your audience full of hope - looking forward to coming events, united, and with a sense of gratitude. To finish well, reinforce your theme, summarize your main points and end with strong statement or maybe a quotation from those below that will resonate on in the minds of your audience. Introduces the theme of your speech. And links or transitions into the body of the speech - your most important and first point. Write your outline on numbered and labeled, (Introduction, Body, Conclusion), cards. Time the delivery of your speech to fit harmoniously into the occasion's program to avoid the embarrassment of going too long, and committing that ultimate sin, being boring. Smile. This is a festive we-are-having-a-good-time-speech. You need to look the part. Practice/rehearse the speech before delivery to your audience and have a few trusted friends or family members listen to it. 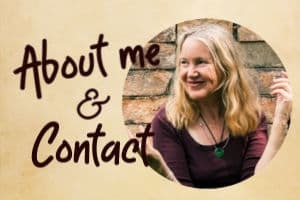 Get their feedback on content, tone and length (2-3 minutes is good!) Make any changes necessary. 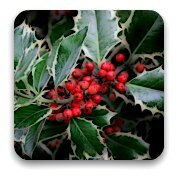 Save the glass of Christmas cheer to have after your speech rather than before it. 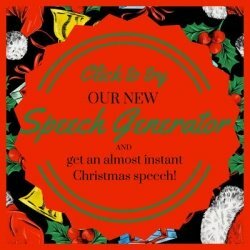 Look over this sample Christmas Speech outline. And you'll see just how easy it will be to adapt the template for your own use! The means to gain happiness is to throw out from oneself, like a spider, in all directions an adhesive web of love, and to catch in it all that comes. 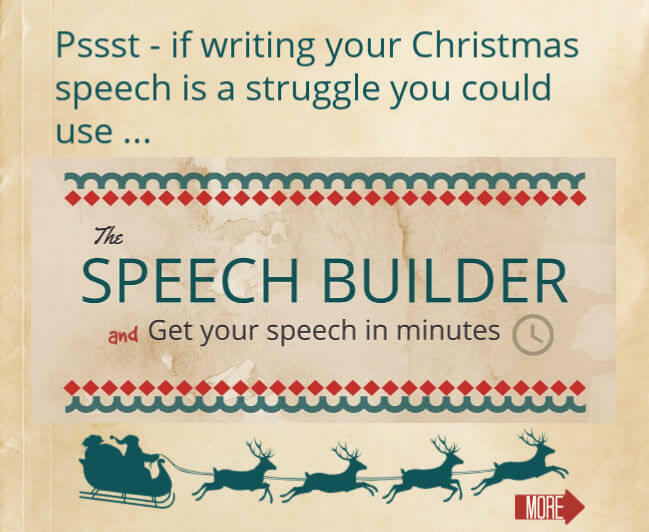 Go well writing and delivering your Christmas Speeches! May they inspire and give joy. Remember the speech builder is there if you need it. 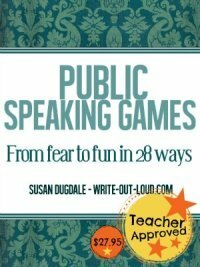 It's an excellent solution if you're finding writing a speech tricky. You'll get a good Christmas speech in minutes.